Photo via Common Ground Media/ITVS. 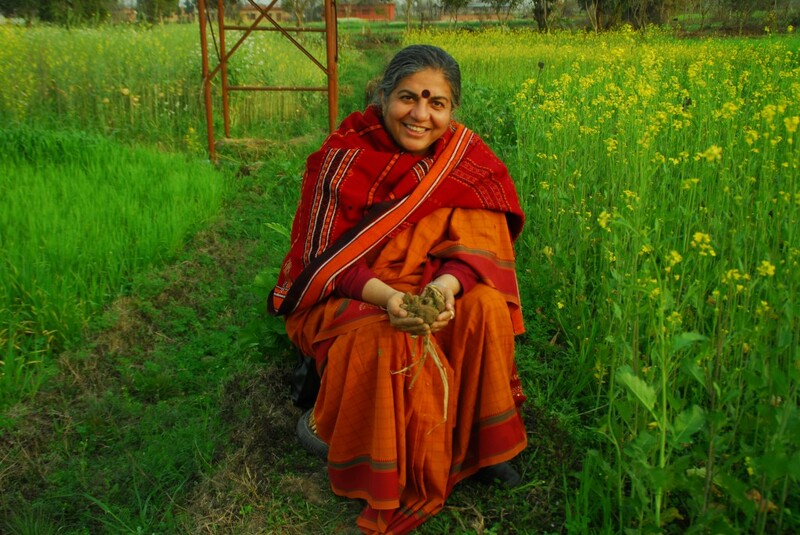 Dr. Vandana Shiva is a champion of the ecology movement. She’s written books, participated in think tanks, and appeared in documentaries. One thing I find inspiring about Shiva’s work is her constant hopefulness in the face of huge opposition. She has taken on such behemoths as the Green Revolution, which is a controversial ongoing movement to use genetically modified plants and fertilizers to produce huge crops. Politically, the seeds can put small farmers in a bind. A downside of the newer technology is that the seeds are patented and must be bought again each year. Many farmers can’t afford this. Shiva has identified herself with the Ecofeminism movement, and is both criticized and lauded for her continued support of women as creators of environmental change. Women are often portrayed as more connected with nature then men. This mysticism aside, Shiva also has some interesting sociological insights on women’s role in ecology. In this interview with Yes!, I like how she calls attention to how gender roles can give women a unique perspective on the environment they live in. Indian women in the 1970’s would gather firewood and water from the environment every day. These women were realizing the bad effects of the logging industry much more quickly than the male loggers, who were more removed from the land. Shiva also believes in a human spiritual connection with nature and the earth. She invokes both science and poetry in describing the forest as a source of life and inspiration. I identified with this, since I’ve certainly felt the peace of being in a natural setting. According to Shiva, nature has a balance that humans should not attempt to bend to our will completely. These sorts of ideas are often criticized as romanticized nonsense. However, Shiva blends this earth-centric spirituality with scientific knowledge (Shiva has a PhD in physics and philosophy) and revolutionary zeal. If you want to do some ecological good deeds in the spirit of Vandana Shiva, why not join a community garden? You’ll get to eat tasty vegetables that you helped grow. You’ll get to enjoy working with the soil and learning about plants from your own experience. Dr. Shiva would approve of the localized and small-scale food production style. This entry was posted in Ecological Hero and tagged ecofeminism, ecology, food, india, vandana shiva. Bookmark the permalink.